The weather forecast wasn’t very promising with both the Bureau as well as the Norwegians predicting a mixed bag on Saturday and sure rain on Sunday. This brought back memories of a previous trip in the area and left me with only a small hope of seeing the area in good weather this time. Nevertheless, we decided to press on regardless and do the trip as planned. We drove up to the mountains on Friday night and met at the pub in Lawson before driving out to Newnes for the night. On the way I was surprised to see the Wolgan Valley road sealed for most of the way till just after the resort. It seems like the Emirates finally got their will of a paved road in the valley. We quickly pitched our tents and went to bed. Dave, who got a leave pass to enjoy a kid-free weekend in the bush with us, particularly enjoyed the presence of a family that camped nearby and had a kid that screamed all night. 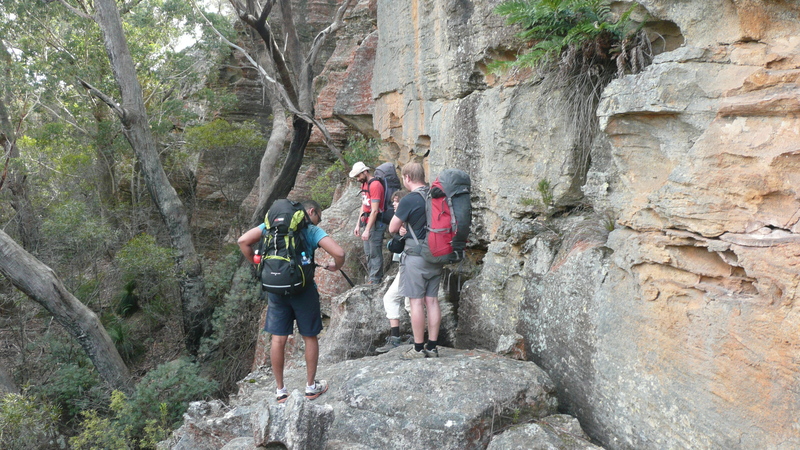 The next morning we were greeted by the stunning views of the Newnes cliffs and good weather. Nevertheless, we decided to plan for rain and because Dave knew several camp caves in the area, we left our tents in the car and only carried much lighter ground sheets. The plan was to make the most out of the Saturday and then have the option to make the Sunday a short and wet dash through the rain and back to the cars. 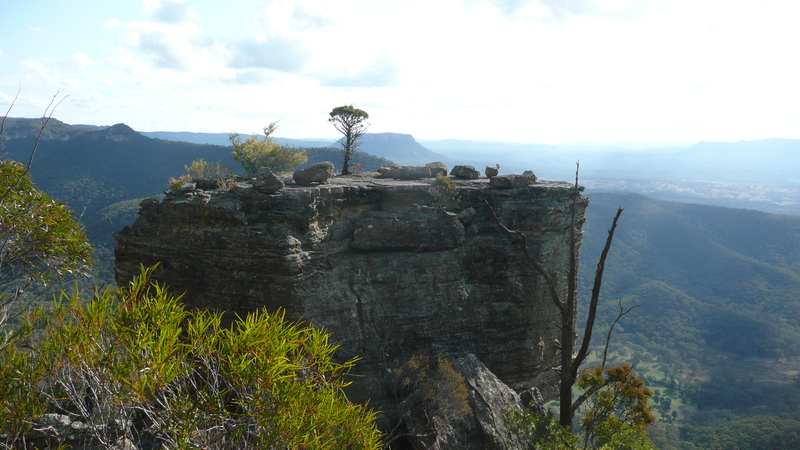 Waking up to the Newnes cliff lines in the morning. We started to ascend Little Capertee Creek but then decided that it would be more fun to go high on the ridge lines instead of following the creek. So we headed up a gully on the right that Dave reckoned he had descended successfully some time ago. After some path finding we reached the top of the ridge and got to enjoy the beautiful views of the area with its cliff faces and red rocks. Looking for a path around the cliffs and to the top of the ridge. It also meant that the real fun part of the trip had started: the ridge ahead of us was full of pagodas with all their little scrambles, obstacles and views. 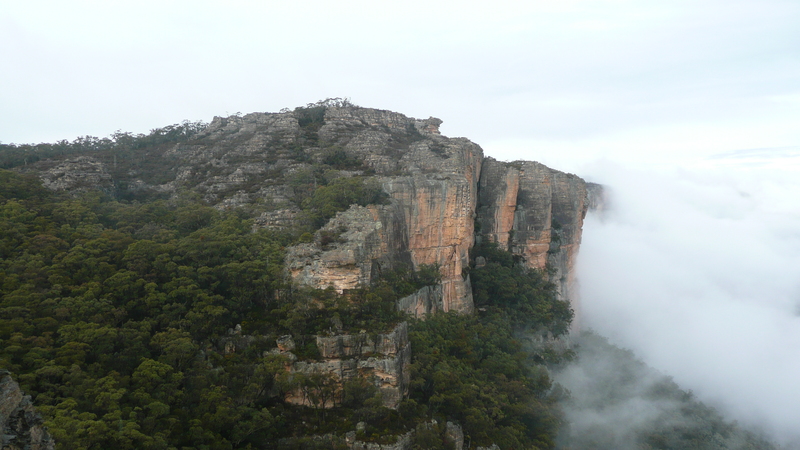 We made our way along the top until we finally reached the escarpment down to the Capertee Valley. There we stopped and enjoyed out lunch in the midday sun. The ridge full of pagodas providing lots of fun. After we were well rested, we decided to head towards Mt Dawson for the night. We climbed the famous Pagoda of Death and then continued along the ridge line and Pagodas for the rest of the afternoon. The “Pagoda Of Death” ahead of us. Along the way we found a spot where another party had obviously camped a while ago. The ground was cleared in places for tents and we decided to spread some sticks and leaves to cover the area a bit. At first we were surprised that there wasn’t any fire circle and thought they might have cleared that up. Boy we were wrong. When we were just moving on we found their fire place: they had dammed a large grove in the side of a nearby pagoda with rocks and then started the fire directly on the rock. Judging by the amount of ashes the fire must have been massive. And not only that: inside the fire place were molten bottles and shattered glass as well as pieces of aluminium foil. Indeed a disgusting thing to see. We collected the rubbish and removed the dam and pushed the ashes out of the area so it might hopefully get washed away a bit over time. Underneath the ashes, the rock had cracked from the heat of the fire and the rock was falling apart while brushing away the coals. Whoever was responsible for this fire has definitely cause permanent damage to the site. Eventually we reached the large cave we wanted to camp at and it was a good spot to stay the night given the weather forecast. The nearby creek was dry, so we packed our water bottles and some snacks and headed towards Mt Dawson to pick up water at a water hole and then enjoy the sunset. We approached the water spot and to our delight saw the reflection of a pool of water 10 m below us. Unfortunately, it turned out that the pool was only a little puddle in a rock and way too small to supply enough water. Thus, we headed back and the other way to a small canyon that finally supplied the water we were searching for. After that we returned to our cave and started a fire, brought out the food and booze and quite a while later, we went to sleep, knowing we had made the most of the day. Somewhat after midnight the rain and thunderstorm finally started. The storm was quite close by and each lightning strike lit up the entire cliffs – followed immediately by what seemed the longest thunder I had ever heard. I was glad we weren’t camping on top of the cliffs that night. The next morning during breakfast the rain slowed down and a little bit of blue sky showed up. We went back up to the escarpment and got to witness one of the most amazing views of the wet landscape with clouds hanging in the valley below us. While we were standing there, the rain stopped completely and shortly after the clouds started to crawl up the mountains until they reached us and caused a white out. 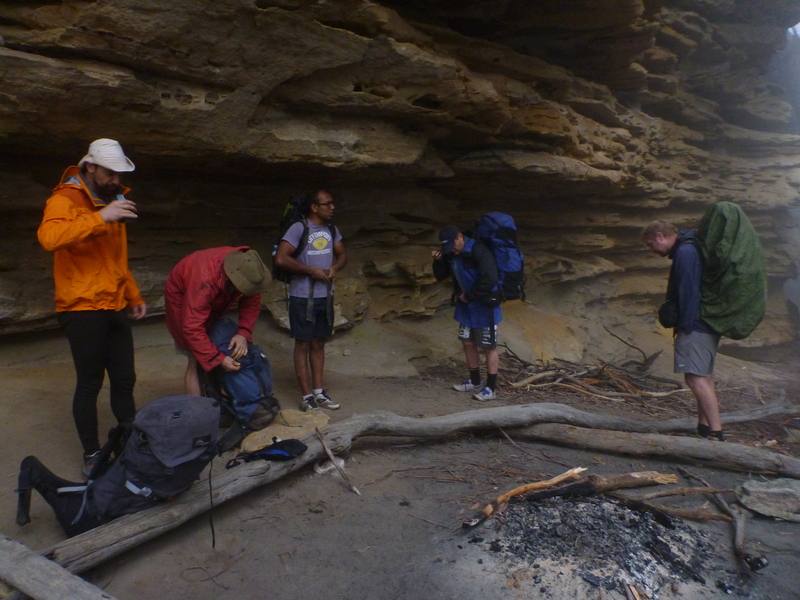 We returned to our cave, packed our gear and headed off the short way back towards the cars. The way back was uneventful with the occasional scrub bash so we reached the cars around lunch time – definitely not too late because a few minutes after we started driving, the rain started again. We finished the trip with a good lunch and beer in Mt Victoria before we all went our way and back home. All in all a great weekend which turned out much, much better than the weather allowed to hope for when we set off. The view over the Pagoda landscape.